Hello and blessings to you. Thank you for your interest in Chesapeake Bible College & Seminary and our Christian Counseling Programs, under direction of Rev. 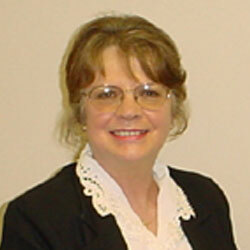 Carolyn “Bonnie” Aronson, Ph.D., B.C.M., M.P.C., D.C.P.C., for Undergraduates and Graduate Studies. The State of Maryland requires that the following be stated: “Chesapeake Bible College & Seminary is a religious institution operating in the State of Maryland pursuant to an exemption granted by the Maryland Higher Education Commission, without a certificate of approval from the Commission, as specified in the Code of Maryland Regulations 13B.02.04”. State Licensing boards are not required to recognize the CBCS Christian Counseling program as a prerequisite of licensure. Pastors who want to learn how to counsel members of their church and community who are experiencing problems. Professional counselors who want to become A.P.S. certified and learn a Biblically-based counseling model with proven success. Is Christian Counseling Certification and Licensing for YOU? We receive many calls from individuals who are seeking a sense of direction regarding Christian Counseling. Each individual must decide if he or she wants to be an agent of the state or a servant of the Church (Body of Christ). If you have a divine call on your life to counsel and minister to the hurting, then a state license may inhibit such ministry. The National Christian Counselors Association (NCCA) Licensing Program, available through Chesapeake Bible College’s Master of Pastoral Counseling Degree and/or the Doctor of Clinical Pastoral Counseling Degree, is NOT a state license and is, in fact, distinctly different. Most states have regulatory laws governing the practice of psychology. Many of them also legislate the practice of general counseling. The laws vary from state to state. For example, some states have a counselor category called “Licensed Professional Counselor”. Therefore, the NCCA requires its counselors to clearly identify their license, e.g., “NCCA Licensed Pastoral Counselor” or “NCCA Licensed Clinical Christian Counselor.” This ensures that the NCCA counselor is operating within legal and ethical standards, and maintains the public’s trust and confidence. State regulatory laws help to protect the public and ensure professionalism within the counseling profession. The NCCA strives to attain a similar goal with the Christian community and, at the same time, operate so as to avoid infringing upon state regulations. The major difference between state-licensed professional counselors and Pastoral or Christian counselors, who are licensed by the NCCA and under the authority of the Church (Body of Christ), is clear and well-defined. Counselors who have been licensed by the state are held to strict ethical standards which mandate an individual’s right to be free from religious influence. The state licensed professional counselor is forbidden to pray, read or refer to the Holy Scriptures, or counsel against things such as homosexuality, abortion, etc. Initiating such counsel would be considered unethical by the state. The only time a state licensed counselor can involve religious (Christian) principles, morals, activities, instruction, etc., is if the counselee initiates or requests counsel in these areas. The state-licensed counselor may not have the education, experience and knowledge of Scripture that Chesapeake Bible College and the NCCA provides. Opposite from that, Pastoral counselors are required to pray, share their faith, read from the Holy Scriptures, etc. The fact that Pastoral and Christian counselors do these things creates a clear distinction. We are two distinct professions and govern ourselves accordingly. As you can readily see, the state governs secular counselors and the Church is responsible to set standards and govern ministers who have devoted their lives to the ministry and to Pastoral counseling. None of this is to say that the Christian counselor, minister or priest is not permitted to request fees and receive remuneration for the services they render, as long as they remain adherent to the state laws governing such procedures. Provide their service under the authority of a legally organized local church, a national church organization or a 501(c)(3) not-for-profit ministry. Complete specialized training provided by Chesapeake Bible College and the NCCA. Uphold Chesapeake Bible College’s and NCCA’s Code of Ethical Standards. The National Christian Counselors Association is an educational and training organization for Christian counselors. The NCCA includes ministers, professional Christian counselors, testing specialists, medical doctors, attorneys and educators. It was established in 1981 by Doctor Richard and Doctor Phyllis Arno as a non-profit corporation in order to conduct research and develop a therapeutic procedure based on Scripture. The Arno Profile System was developed and is currently used by over 4,000 pastors and professional counselors to aid them in their counseling efforts. These counselors report an accuracy rate of over ninety percent (90%) in identifying an individual’s in-born God-given temperament. The NCCA’s main purpose is to provide quality training for pastors and Christians who feel God’s call to counsel. Their training results in credentials that the community (Christian and non-Christian) will recognize. As a licensure candidate, you will learn the Arno Profile System (APS) for counseling. APS is an easy-to-learn counseling technique used by thousands of lay counselors, professional counselors and pastors throughout the United States and in nine foreign countries. The Christian counselor administers a questionnaire, which takes fewer than ten minutes for the counselee to complete. The questionnaire measures the counselee’s needs, natural traits, strengths, and weaknesses according to their temperament. These are identified in the computerized Arno Profile System report, providing the counselor with in-depth information and the best way to counsel the individual. The system enables a qualified counselor to identify the counselee’s temperament problems faster and more accurately. Excerpts from the National Christian Counselors Association “Licensing Program for Christian Counselors”. 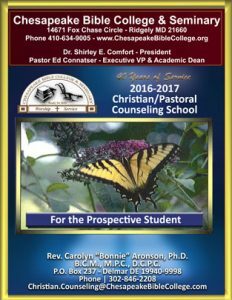 I’m happy to talk with you about Chesapeake Bible College’s External Studies School of Pastoral Christian Counseling Degree Programs. We will work together to further the Kingdom by offering hope to those who are hurting.